Lower: Precision machined from forged 7075-T6 aluminum, these lowers are then Black anodize hardcoated to MIL-8625 Type 3 class 2. With a Nickel Boron 2-Stage Trigger Assambly, a Magpul MOE Stock, and a Magpul Miad Grip. This is an ideal platform for the 6.5 Creedmoor. Are there any plans to make a 22 inch 6.5 or 308 model? Are there any plans to make a 22 inch 6.5 or 408 model? How many grooves does the rifling have? Style of rifling? BEST ANSWER: Mine weighs about 12 pounds. What is the bare rifle weight? I believe the "lightweight" in the description is only referring to the m-lok handguard being lightweight, not the rifle as a whole. The way I remove the muzzle break's if I can't find my AR tool. Wrap the muzzle break in tape ,and use channel lock pliers. That way you don't leave room marks..
Is the A2-style muzzle device removable? BEST ANSWER: It is removable with the right tools. What exactly does that mean? It is screwed on tightly and one must have a barrel vice or the like to avoid damaging the receiver, or? Do you know what thread pitch this barrel has? It is. Make sure you have crush washers on hand. What is the total length of the rifle? Is this build a low or high profile upper and lower receiver? BEST ANSWER: Yes, mine is very accurate. I had some ejection issues but they are getting better with some gas block adjustment. The rifle is a very good value IMO. I am getting 0.9 MOA with mine. I have had one jam in 100 rounds. Is this allowed to be shipped to Massachusetts? What magazine should be used with this rifle? 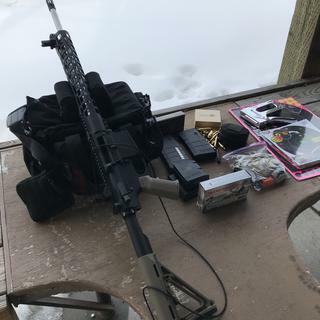 I have a PA-10 in .308, can I use the same magazine for 6.5 creedmoor? Can a 308 upper be attached to this lower? Does this have an adjustable gas block? Do you have a five or ten rounds mag for this rifle? What is the total lenght of this rifle? Can anyone tell me if there is a slimmer hand guard preferably Key Mod full rail that will fit this gun? Will it accept 10 round PMAGs? BEST ANSWER: Yes, of course ....... just be certain they are for the 7.62 X 51. Great gun. Just came from the range sighting mine in. Yes, I use the 10 round PMAGS in mine, and they work fine. One of the two mags I bought has to be seated firmly to latch in place, but works fine. Does this have a 2stage trigger in the lower? BEST ANSWER: There is about a 1/8" of smooth take-up with light spring resistance. The break point can be clearly felt at that point and breaks at 5 lb 6 oz on my RCBS trigger scale. Yes, but not a high quality one. BEST ANSWER: Most likely will not work there is no military specifications on ar 10’s it is not a service rifle. Just buy a psa 10 upper to go with a psa lower and will work like magic. It is supposed to compatible with DPMS low profile receiver components. That is the best I can tell you. What size muzzle break will I need for this rifle? BEST ANSWER: The oversized birdcage A2 that comes is great . If you seek an aftermarket I would get an .308 or better for the high pressure of the Creedmoor, but the recoil is extremely manageable. What size trigger pins does this have? BEST ANSWER: It has the "small" pins. I did not take out the trigger to mic it but from the outside of the lower they are about .150. Going on memory, the lower pins are usually .154". What type mag would be used in PA65 6.5 Creedmore lower I got the complete lower then got the complete upper put it together . Seams like I read a AR 10or 308 would work but I want to make sure . So if anyone knows for sure I would appreciate the info.? BEST ANSWER: Some companies make a dedicated 6.5 magazine but a 308 magazine will also work fine. Is this a new rifle? Is there a specific scope mount height needed for this rifle??? Purchased the PSA 10 Gen2 Lower and PSA 65 upper. Used Magpul P Mags as directed. The rifle is awesome. Unbelievable value. No issues. Added TACTICON flip sights and was dialed in in less than 5 rounds. Awesome rifle. Recommend to anyone. PSA has nice equipment t.
Although this is my first 6.5C AR-10 I've had the opportunity to shoot other brands. Here's my .02 worth. 3 Good points...1st is the rifle itself, the attention to detail is amazing. Everything is lined up perfectly, shoots amazingly. 2nd is the price, c'mon...all this for $400 some odd bucks cheaper than anyone else? 3rd is the customer service, I had an issue where either PSA or myself (prob me) stripped out the Allen to adjust the GB. I messaged PSA on a forum they're on. Received a message from Josiah and he offered a call tag to take care of it. It so happens I was able to remove it myself. Outstanding company , can't wait to save up for something else! I love this rifle. 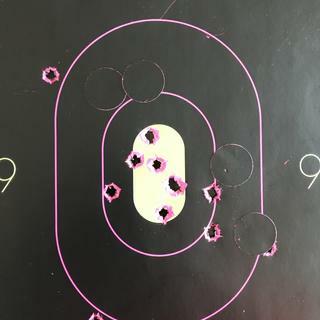 The trigger is the equal to my Rock River 2 stage, the fit and finish is spot on, and the 6.5 Creedmoor is really perfect if you are after accuracy. Did I mention I love this rifle? Great value. Highly recommended if you are after 20" barrel rifle. Bought this at a low price as an entry level into LR Shooting, as always prompt delivery and the performance was over my expectation. This is a pretty good rifle as accurate as my 308 Springfield Armory with a match barrel. I do agree that they could have better QC the spring on the dust cover was poking out I had to trim it my self. But i haven't had any issue with ejecting cases. I used heavy lube and i haven't had any jams. I could giving it 4 starts but the only defect i found was cosmetic and i was able to fix it my self. Fired a little over 100 rounds through this gun so far not very happy the groups are 2-4 inches at 100 yards out of a gun vise. Sending it back to Palmetto hoping for a new barrel or some sort of tune up, I will update this review when it returns. Occasionally it shoots an MOA group but there will be 1 or 2 fliers over an inch away. I am not shooting cheap ammo I tried 5 different factory hunting/match ammos. I thought perhaps the semi auto action might have damaged the bullets when feeding. So I loaded 1 bullet at a time without the magazine. No improvement. 3 different shooters have tried grouping this gun same result. So it is not shooter error. Tried cleaning it. Tried shooting it dirty. No improvement either way. I want to love this gun. Will update if accuracy improves. Straight shooting gun and well built. Having trouble with PSA 6.5 Creedmoor. It is not ejecting the shell casing. I have shot about 100 shells through it and it has caught around 10 shells. Any ideas for fixing this issue? We apologize you are having issues with your rifle if you would please contact us at 803-724-6950 we would be more than happy to find a resolution to get your rifle fixed. I have 60 rounds through it, all Hornady Match ammo. It seems to shoot very well, and I've managed a couple of 1/2" 3 shot groups at 100 yards. The first box about 1 in 3 did not eject properly, and those that did eject, ejected at 1-2 o'clock. I've adjusted the gas block, and that seems to have helped - the last 20 round I only had one FTE. Need to inspect in more detail now that it has a few rounds through it, and will also load some handloads for it. One minor gripe is the 10 rd Magpul mags have to be rammed home hard to get it to latch in place. I'll investigate this further; it may just be a bad mag. I did change the stock to a Magpul ACS, which locks in position and is better suited to the rifle IMO. Overall the rifle is a good value; the accuracy is excellent, though I do hope PSA can do a better job on the functioning issues in the future. Been reading countless articles about the long range accuracy of the 6.5 Creedmoor round. Did quite a bit of research and shopping to find the right rifle. My new PSA is great! Well built and it functions perfectly. I mounted a SIGHTRON 8-32X56 scope. Accuracy is as-expected and it's fun to shoot!!! I own SEVERAL AR15's but this was my first AR10 grade rifle. Alright gun had to do minor work to it for it to cycle right. Doesn’t group very well. Tried to change forguard, but proprietary barrel nut makes it difficult and hard to find. Wanted a slim key mod forguard was givin a part number by PSA, and it wouldn’t worknwithout modifications, so sent it back. Excellent out of the box accuracy. Best rifle so far, bar none. The component and build quality of this rifle is second to none. It is clearly the best rifle but I have a bought from PSA so far. I have been shooting .308 Winchester all of my life- I fell in love with that cartridge in the late 60s and I’ve used it ever since. I can shoot one MOA out to 500 yards with that round in an old M-14. Well worth the money. Maybe not the prettiest but operates as advertised, pretty damn accurate. Very impressed with this semi-automatic rifle. Cannot beat the price from anywhere and it is well made, solid, and made in the USA. Took it out of the box, mounted my 3X17 ATN Day/Night Scope and zeroed at 100 yards with 4 bullets. 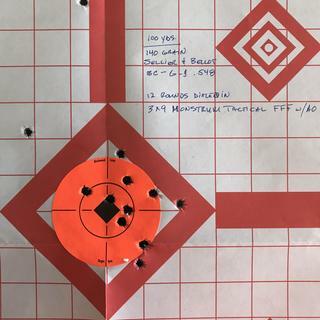 Two at 25 yards and two at 100 yards. Shoots as good or better than my bolt action 6.5 Creedmore. Took this gun out today for its first shoot. No optics or any add-ons just out to cycle rounds through it. Very well put together rifle, the kick is manageable to deal with and comparable to some ar 15's. The cycling and 2 stage trigger were both super smooth and with some minor polishing will be flawless. I've had my eye on an AR that shoots for a 6.5 Creedmoor for a long time and was looking at few other specific models. I semi felt I was settling, however, I was very wrong. I can not speak highly enough on how happy I am to have bought this gun over the others. The PSA65 Gen2 came with everything I wanted on it at roughly 500 dollars less than the competitors. Thank You Palmetto State Armory for this product and keep up with the stellar work.